NBC finished in first place for the evening with a 7.8/12 household/rating share and 12.04 million viewers, but was second among adults 18-49 with a 4.5/11 rating/share. 7:30 p.m: Football Night in America (3.1/5 HH rating/share, 4.54M viewers, 1.7/5 A18-49 rating/share). 8:15-11:04 p.m: NBC Sunday Night Football: New England Patriots at Indianapolis Colts (10.6/16 HH rating/share, 16.74M viewers, 6.2/15 A18-49 rating/share). ABC followed in a tie for second place for the evening with a 7.1/11 household rating/share, was alone in second among viewers with 11.27 million and was third among adults 18-49 with a 3.9/9 rating/share. 3:30 p.m.: NASCAR Dickies 500 Texas (3.7/7 HH rating/share, 5.88M viewers, 1.8/6 A18-49 rating/share). 7:30 p.m.: America’s Funniest Home Videos (3.6/6 HH rating/share, 6.43M viewers, 2.1/5 A18-49 rating/share). 8:00 p.m.: Extreme Makeover: Home Edition (6.9/10 HH rating/share, 11.65M viewers, 3.9/9 A18-49 rating/share). 9:00 p.m.: Desperate Housewives (10.1/15 HH rating/share, 15.93M viewers, 5.8/13 A18-49 rating/share). 10:00 (10:01) p.m.: Brothers & Sisters (6.5/11 HH rating/share, 9.62M viewers, 3.4/9 A18-49 rating/share) closed out the evening for ABC. CBS finished in a tie for second place for the evening with a 7.1/11 household rating/share, but was third among viewers with 11.19 million and fourth among adults 18-49 with a 2.6/6 rating/share. 7:00 p.m.: 60 Minutes (9.1/14 HH rating/share, 14.37M viewers, 2.7/7 A18-49 rating/share). 8:00 p.m.: The Amazing Race (6.0/9 HH rating/share, 9.76M viewers, 2.8/7 A18-49 rating/share). 9:00 p.m.: Cold Case (7.5/11 HH rating/share, 11.64M viewers, 2.6/6 A18-49 rating/share). 10:00 p.m.: The Unit (5.7/10 HH rating/share, 8.97M viewers, 2.3/6 A18-49 rating/share). FOX followed in fourth place for the evening with a 6.4/10 household rating/share and 10.74 million viewers, but managed a strong first place finish among adults 18-49 with a 4.9/12 rating/share. 4:30 p.m.: FOX NFL Sunday (14.3/26 HH rating/share, 23.27M viewers, 8.6/27 A18-49 rating/share). 7:35 p.m.: The OT (7.1/12 HH rating/share, 11.49M viewers, 4.4/12 A18-49 rating/share). 8:00 p.m.: The Simpsons (6.8/10 HH rating/share, 12.40M viewers, 6.2/15 A18-49 rating/share). 8:30 (8:31) p.m.: King of the Hill (5.0/7 HH rating/share, 8.50M viewers, 4.2/10 A18-49 rating/share). 9:00 p.m.: Family Guy (5.8/9 HH rating/share, 9.99M viewers, 5.1/11 A18-49 rating/share). 9:30 (9:31) p.m.: American Dad (4.4/7 HH rating/share, 7.09M viewers, 3.6/8 A18-49 rating/share). The CW was left in fifth place with a 0.5/1 household rating/share, 0.75 million viewers and a 0.2/0 rating/share among adults 18-49. Note: HH rating/share numbers for individual programs on The CW was not available for this evening. 7:00 p.m.: In Harms Way-REPEAT (840,000 viewers, 0.2/1 A18-49 rating/share). 8:00 p.m.: Valentine-REPEAT (772,000 viewers, 0.2/1 A18-49 rating/share). 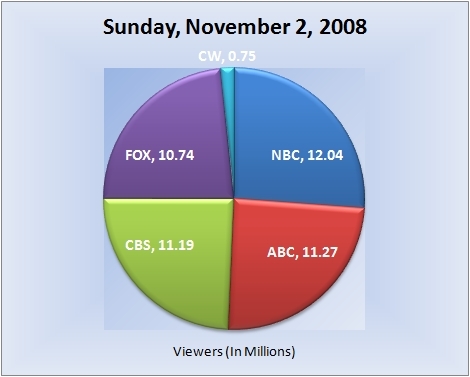 9:00 p.m.: Easy Money-REPEAT (650,000, 0.2/0 A18-49 rating/share) ended the evening for The CW. Note: Network average numbers from the week prior are based on fast national data. Comparison’s from the week prior (or episode-to-episode, etc.) on specific shows are based on final national data. Ratings for the current day are based on fast nationals. (Expect all three scenarios to be the case at all times, unless otherwise noted). The final rating for first-run episodes that aired this evening will be reported the following week. So for example, the final rating for tonight’s episode of “Desperate Housewives” will be reported in next weeks report for Sunday, November 9, 2008. Also keep in mind that because these are fast national ratings, numbers may increase or decrease when the final nationals are released.